I thought since I skipped June, I should check in for the July budget with Franish, just to make sure I don't go crazy and stop tracking my spending. It helps me knowing that I have to be accountable to the interwebs. 1. Zella leggings from the Nordys sale - $35.93 - my first Nordstrom purchase. 2. White plum blue scalloped shorts - $22.84 - sold out. 3. J Crew red & white striped top - $18.18 - my first J Crew purchase as well. 4. eShakti striped skirt - $15.90 - no longer online. 6. H&M skirt off eBay - $8.50. Sooooo I daresay I did mighty fine (for me) this month. Big round of applause for me. need 1, 3 and 4! THANKS!!! That striped skirt is a dream! Only $16 at eShakti?? Was it on sale? So sad that red striped shirt is gone!! It's adorable! Yay for first time Nordstrom/J Crew purchases! Great items! I love the striped skirt and the scalloped shorts! That striped skirt is amazing! It's definitely a piece you can dress down and dress up! Kristen - you did good this month! I love all of your purchases - especially the scalloped shorts! <3 How are the Zella leggings? I haven't pulled the plunge since I usually wear cheap workout clothes! Go girl!! I honestly would die if I added everything from this week that I spent,,, I was really bad but I was also on vacay so oh well! ;) Love that stripped skirt! 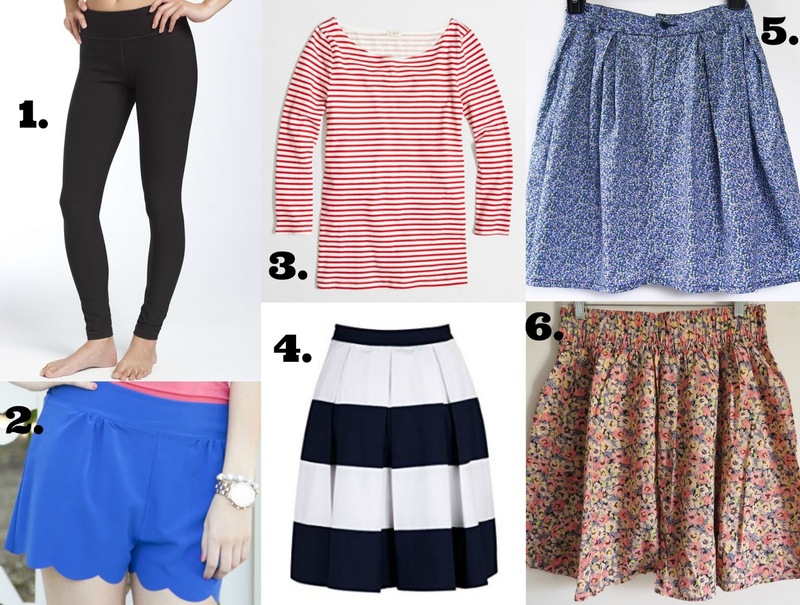 Way to go lady :) Love all of these, especially that last skirt. Cute! Love those shorts and that skirt! So cute! Well done my dear! You did good and got way more bang for your buck than me. I'm impressed. ooh i'm loving all of the things. those scalloped shorts are so cute, and i love that j.crew top too! The Zella leggings are they worth it? Someone said they are worth the higher price and so much more comfortable than cheap ones. That black and white skirt is everything! Too bad it isn't available any longer. I love that striped skirt!!! I just <3 stripes! I always have! I think you did mighty fine as well! :) Love that black and white striped skirt! This is impressive! I looove those scalloped shorts! You did fabulous girl!! The leggings are amazing right? Oh and I love that striped skirt! Good balance and nice mix of items. You can never go wrong with leggings.